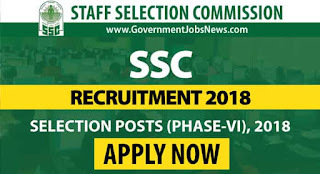 Staff Selection Commission SSC Recruitment 2018 Selection posts Phase-VI notification is published on 05.09.2018. 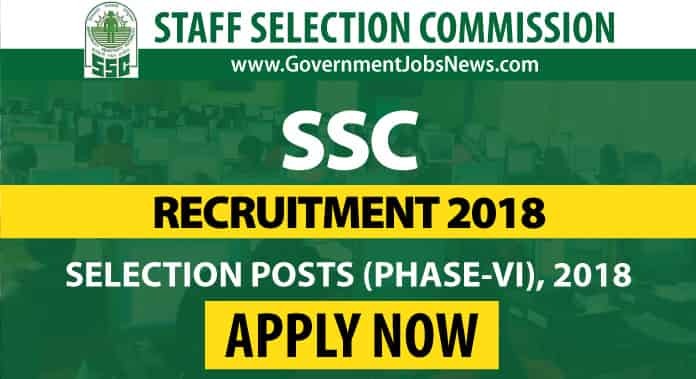 Recently Staff Selection Commission decided to update the last date of applying from 30 September 2018 to 12 October 2018. This post is only for notification and to make our visitor about government jobs updates. Total Duration: 60 Minutes (Total) For VH/ OH (afflicted by Cerebral Palsy and locomotor disability wherein the dominant writing extremity is affected to the extent of slowing down the performance of the candidates). [Pl. see Para 12 (C) & (D) of notice].- 80 Minutes. Age relaxation is applicable as per SSC Rules. You can check Official Notification for more details.